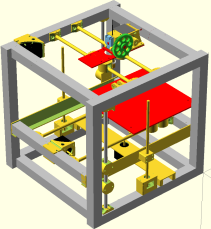 3D-Printizer kit contains all components you need to build a robust 3d printer. Mass: 15 kg. Printer is robust in order to minimize vibrations. Hotend : J-Head compatible. Max temperature: 240 C.
Layer height (standard): 0.25mm. Can be set to 0.1 mm but it will take more time to print. Materials to be used: PLA / ABS. Other materials can be used as long as they don't exceed the temperature specifications of the hotend. Nozzle size: 0.4mm (standard). A larger nozzle (for instance 0.5mm or larger) can be used for faster printing. Also, a smaller (0.35mm or less) can be used for better details. Plastic parts: PLA (green, yellow and red). Other colors on request. Please send us an email after you place the order. All orders are sent within 2-3 working days after payment confirmation. It can take up to 1 week if the specified color for plastic parts is not in stock. Price: 500 Euro. Shipping is not included in this price. Place your order here. Note for EU buyers: Our company is VAT exempted, so no VAT is added to this price and you don't have to pay VAT in your country.